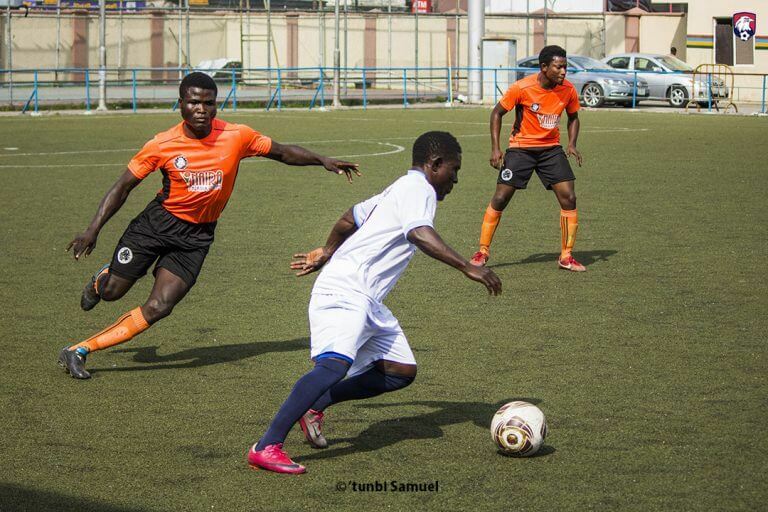 TPL 7 Matchday 2 has been concluded after 6 games and fully delivered on its promise of upgraded performances. The highlights of Matchday 2 included more intricate game plays, beautiful goals scored with great artistry and a display of unimaginable levels of technique. Not to be left out were the emotional reactions from players and spectators alike as fans turned out in their numbers to cheer-on their favourite teams. A total of 15 goals were scored, one less than recorded at Matchday 1 but the quality of the goals were such beauties of the highest order. Matchday 2 kicked off with Guns vs Raptors, a game many expected the Guns to emerge victorious and move up the table after a disappointing Matchday 1. However, Raptors produced a scintillating performance and surprisingly took the lead through UK barely 3 minutes into the game, a goal that signalled their intention to go all the way this term. End-to-end action continued but no team was able to find the net as Raptors took their lead into half-time. Guns produced a rallying second half performance to get back into the game, first with a shot from distance that was safely parried away by the Raptors goalie, and then Ifedotun with a Cristiano Ronaldo-esque freekick that crashed into the crossbar, but were denied by a mixture of resolute defending, fingertip saves, a bit of bad luck and some time-wasting from Raptors, who held onto their early goal to record their first ever win in the history of The TPL, 0-1 it ended, the first clean-sheet of TPL 7. Then came the highly anticipated game between two of the in-form teams Raineri vs Pacers, which delivered on its promise as it was hugely entertaining. Raineri started the game the more determined of the two, closing up spaces immediately and tensioning the Pacers defence as they looked to tighten their lead at the top of the table. After an early exchange, the chances began to come Pacers way though they were kept at bay via brilliant goalkeeping from Raineri’s Matchday 1 hero, before a momentary lapse in concentration saw Ezekiel’s shot take a deflection off a Raineri defender for the first goal of the game, followed by a string of saves from the Raineri goalie to ensure it was just the lone goal to Pacers at half-time. Udo’s long-range shot 6 minutes into the second half proved unstoppable, as Raineri got a deserved equaliser and the entire stadium reverberated with deafening applause from spectators, but it was a moment of hesitation and indecision from Raineri’s Biola that allowed Pacers to steal the ball in midfield and produce a swift counter that saw Samson net the winner. 1-2 it ended, in favour of the Pacers, but it was another memorable performance for the Raineri goalie, keeping the scores respectable. The grudge match between Teknon and Alphas saw both teams trade tackles and execute hours of strategy and game plan albeit with caution. The best chances of the half fell to the Alphas but both sides went into the break goalless. The breakthrough came for Alphas, 9 minutes into the second half, Michael with a well-struck shot to give them the lead. Moments later, Michael was brought down cynically as he bore down on goal, with Jo the culprit bagging a yellow card for the team. Another headed effort struck the upright with the Teknon goalie sprawled on the turf, clearly beaten, as Alphas turned on the heat, seeking to put the game beyond reach. WJBNMC got the equaliser for Teknon with a beautifully placed header 2 minutes from time, and a late surge from Kayode Kante left four Alphas defenders in his wake but his effort was palmed behind for a corner kick. There was to be no more drama as the game ended one goal apiece. Raineri vs Raptors started back and forth with no one taking the initiative until Biola turned up in the 15th minute, coolly slotting home for Raineri as he atoned for the mistake that led to the 2-1 loss to Pacers. Not long after that goal, Shahin missed the goal by inches, failing to double the lead for Raineri. Half-time beckoned and both teams went into the break with Biola’s goal the only difference. A shot from Adewumi at the restart was spilled into the net by the Raineri goalie for the equaliser from Raptors, but 16 minutes later a defensive mix-up by the Raptors allowed Van-Opsie get a second for Raineri. Moments later, emotions took over as a Raptors defender repeatedly kicked a Raineri attacker while he was down and the resulting melee was prevented from turning into a full fracas by the intervention of match officials and players, with the defender seeing red for his actions; the first red card of TPL 7. Play resumed but there was no further action as it ended 2-1 to Raineri. Guns vs Teknon started brightly for Teknon as a goal-mouth scramble in the Guns box sees the ball kindly roll across the face of goal in the early stages. A late reaction from the Teknon goalie saw a tame freekick from Ebonie find the back of the net in the 15th minute to give the Guns the lead. Interestingly, that guy Ebonie has scored all of the Guns’ goals so far this season. Another well-placed shot from the mesmerising Dolapo, 9 minutes into the second half saw the them take a two goal lead and it could have been three, moments later, when Legendary delivered another Ronaldo-esque freekick onto the crossbar. They had to settle for a 2-0 win which moved them off the bottom of the table. The final game of Matchday 2, Pacers vs Alphas saw Alphas take an unexpected lead 5 minutes into the game via Michael, who went close moments later. It was an inspired performance as Alphas upstaged the game favourites and defending champions, doubling their lead in no time and then going close again and again and again. The Alphas could have ended the half 5 goals up but squandered opportunity upon opportunity with disappointing finishing. It was proving to be a fairy tale. Second half saw Pacers come out of their blocks, firing on all cylinders and were rewarded when Wasiu (remember him, winner of the best goal award at TPL 6 for a stunning freekick) dispatched a freekick into the top corner. It was a beauty to behold. Couple of moments later, Wasiu let fly from distance with reckless abandon and the shot took a wicked swerve, dipping just beyond the Alphas goalie’s out-stretched hands to nestle into the net, levelling the game at 2-2. Both sides rallied to find the winner but it ended two all. Alphas would wish they had taken advantage of their first half performance as they wonder why they are yet to win a game, despite playing breath-taking football. 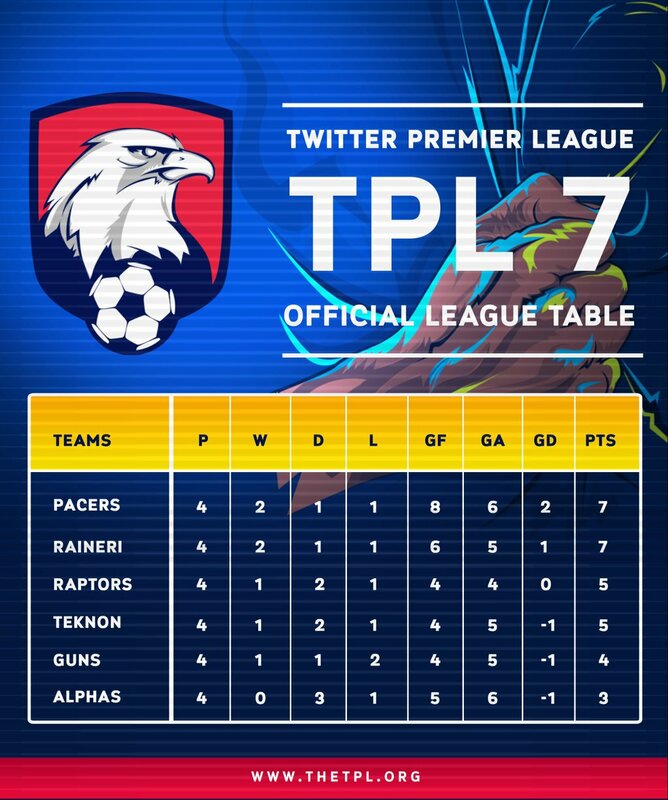 At the end of Matchday 2, Pacers are tied on points with Raineri at the top of the table with 7 points, but lead on goal difference while Guns move up to fifth, and Alphas slip to bottom, yet to win a game. Ebonie (Guns) and Wasiu (Pacers) lead the goal-scoring charts with 3 goals each, while Alphas look to retain the fair play award, as they are the only team yet to be shown any card.